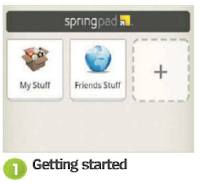 Spriugpad is one of the most powerful and useful apps you can download for your Android phone. 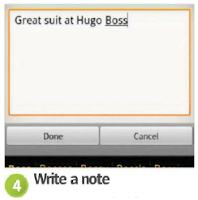 it lets you create simple notes and reminders, giving you a powerful tool that helps to organise the useful aspects ofthe information which constantly bombards our senses. The app lets you create folders into which your notes are placed, and you get a couple as standard. One of them is Friends Stuff. 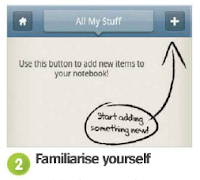 The handy thing with this folder is that you are able to view any public notes made by fellow Springpad users, which is a great social way of keeping in the know.Users can attach notes to files. These can include photographs or audio to name but two. 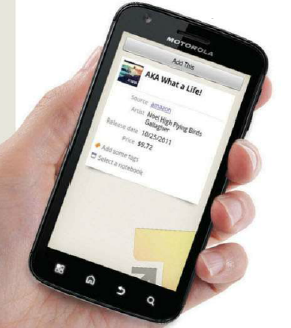 You can also use the in-built barcode reader for speedy real·world referencing which is quite handy nowadays. Making this even more powerful is the ability of Springpad to sync with your desktop web browser. Download the Springpad app.It will ask you to register. Once you have done this, you are taken to the main Springpad screen. You will see two notebooks My Stuff and Friends Stuff. You can store notes within these folders. Let’s say we are out and about and see some nice clothes that we want to buy. We want to store this information in the My Stuff notepad so we tap My Stuff. You will see a ‘+' sign in the top-right hand corner. Now you need to tap on the '+’ sign and you will be given a whole host of options to choose from. You can also scroll down to see more. ln our case, we want to add a note, so tap the Add Note tab in order to be taken to the right input page. Start writing your note in the space provided. The app uses the Android keyboard and it also has auto correction. When you have finished typing your note. simply press Done and it will be saved in your My Stuff folder so you can refer back to it later. But what if the item you see when out and about has a barcode? 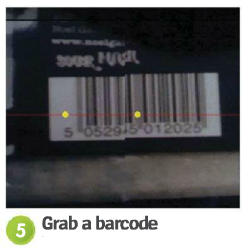 Again, follow Step 4 but this time, scroll the list slightly longer and tap the Scan Barcode option. A scanner will appear. Use it to capture the barcode and on the next screen tap Add This. What if, however, we wanted to remember something for later? Maybe our chicken needs defrostlng. Tap the ‘+* sign as in Step 4, scroll to Add Task. 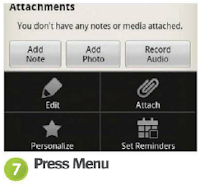 Type your reminder, tap the date to input it and use the attachment options to add notes, photos or audio. 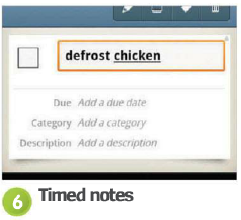 By pressing t:he Menu button on the task page, you can set a timed reminder. You can also edit your entry very quickly. 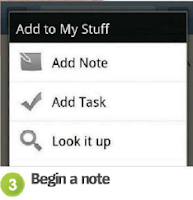 The Menu button works for other notes too. Just open a note and press it to access the options. As well as being able to store notes for yourself and edit them, you can ensure others benefit too. 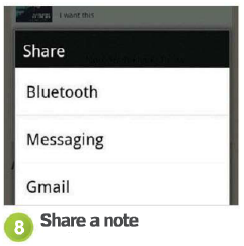 Items can be shared - at a bare minimum - via Gmail. messaging and Bluetooth. Press the Menu button when viewing a note then tap the Share option.